“As If I Don’t Fit There“, 2006 by Mounira Al Solh. »SELF-PORTRAIT WITH REMOTE CONTROL«, 2008, a video installation featuring a single image that shakes endlessly on a tv screen, by Randa Mirza. 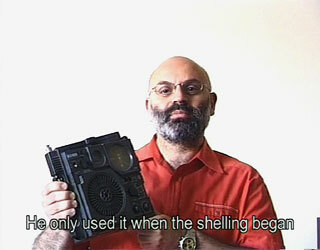 »Objects of War« (2000-2006) is a series of testimonials on the Lebanese war. Each person chooses an object, ordinary or unusual, which serves as a starting point for his / her story. n°1, n°2, n°3 and n°4 by Lamia Joreige.